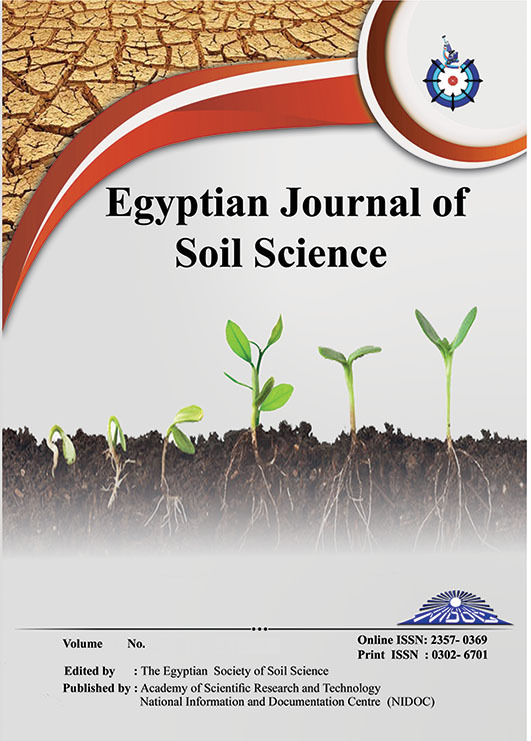 This experiment was carried out during two summer successive seasons of 2016 and 2017, at a private farm in East Owainat area, New valley Governorate, Egypt, to study the effect of soil cover techniques by plastic sheet for cultivation lines: uncovered (UCS), half covered (HCS), full covered (FCS) at different applied irrigation water levels (IR=100, 90, 80, 70, 60, 50 and 40% calculated based on crop evapotranspiration) under surface (SDI) and sub- surface drip (SSDI) irrigation systems on marketable yield, crop quality parameters, actual evapotranspiration (ETa), water use efficacy (WUE), irrigation water use efficiency (IWUE) and yield response factor (Ky) for summer squash fruits "Cucurbita pepo L.". The results showed that, the marketable yield and studied quality parameters except total soluble solid (TSS) and acidity pH of summer squash fruits gave the highest values under FCS, IR=100% and SSDI treatment for both seasons. While, seasonal ETa gave the lowest values 100.48 and 98.95 mm for both seasons respectively, under UCS, IR= 40% and SDI treatment. Meanwhile, the maximum values of summer squash fruits WUE and IWUE were (25.27 and 16.38 kg m-3); (25.59 and 16.52 kg m-3) for both seasons respectively, under FCS, IR= 60% and SSDI treatment. Finally, the lowest values of Ky for summer squash fruits were 0.03 and 0.05 for both seasons respectively, under FCS, IR= 90% and SSDI treatment. This study concluded that the cultivation of summer squash under FCS, IR= 60% and SSDI treatment. could be saved about 42 and 44% of applied irrigation water and increased marketable yield of the summer squash fruit about 16 and 15% for both seasons respectively, compared to that under control treatment (UCS, IR= 100% and SDI).